Preparing a local community or state for the aftermath of a terror attack is unthinkable and difficult to do when one is cognizant of the enormity of such an event, and how it changes the American way of life in the years following. It is something that no one wants to think about, but it must be in the back of everyone’s mind all the time, in order to physically and mentally prepare for the possibility that terror may one day, rear its ugly head in our own backyard. Local authorities, police, EMS, and other relevant entities must have a blueprint to follow if the unthinkable happens. Terrorism comes in many forms, as it can be inspired by religion, political affiliation, or other radical ideology (Antifa, Occupy, ISIS, etc.). It is important to know the ins and outs of different violent ideologies, and really study what makes them tick, if you are going to be able to anticipate their movement, operation, and when they might strike. This is crucial at the federal, state, and local level. Preparation for potential threats, is different from a response to an attack because the aim is prevention, and awareness, rather than responding to the chaos right of boom, and cleaning up dead bodies. Anti-terrorism and counter-terrorism are in the same vein, but they have different meaning. Counter-terrorism is retaliatory in nature and involves hitting back, whereas anti-terrorism focuses on prevention. All these things must be considered when devising a plan to prevent terrorist attacks, and you must understand what drives terrorists to commit the atrocities that they do. Sun Tzu wrote in “Art of War”, that you must know your enemy and know yourself. This holds true, even today as we are forced to engage terror in battlefields all over the world. Federal, state, and local authorities have to be on the same page and coordination is paramount, synchronization is key. In the war on terror, prevention is a must because this is the most effective way that we can avoid the unnecessary loss of American life at the hands of terrorism. Terrorism has no face, no race, no nationality, it is ideological in nature, and anyone can fall prey to the terror mindset and influence. In order to prevent attacks, these characteristics of terror groups and their motivations, have to be studied and understood by everyone that has a responsibility to serve and protect Americans and our interests. In Sun Tzu’s timeless battlefield strategy masterpiece Art of War” Tzu states, “If you know the enemy and know yourself, you need not fear the result of a hundred battles. If you know yourself but not the enemy, for every victory gained you will also suffer a defeat. If you know neither the enemy nor yourself, you will succumb in every battle.” This is true now just as it was centuries ago when Tzu wrote this piece. We must not forget our American values, but we also need to understand the values of those that wish to bring destruction to our republic, and our way of life. In order to devise an operational plan for terror prevention, you have to understand the mind and the ideology of the terrorists and what they are hoping to achieve through their actions.Identifying these ideological markers makes it easier for authorities to shut down potential attacks, well before they happen. Evil will always exist in some form, and there are cases where someone will just flip out and do something stupid. However, the lone nut is usually the exception, not the rule. Most terror attacks have a motivation, and a desire to achieve an end or trigger a response of some sort. If the perpetrator is a lone disturbed person, then it does not meet the terror criteria. Mental illness does necessarily equal terror. 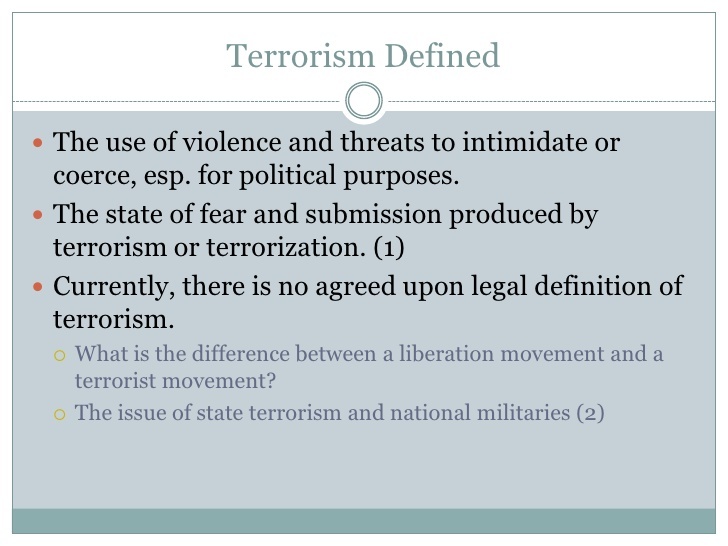 Terrorism is defined by its intent, not necessarily the act itself or the size/scope of the act. Terrorism is generally associated with larger events, because the larger the even, the greater the need for funding, materials, supplies, or other support from a larger terrorist entity abroad or here at home. Recognizing potential terror threats is not a cookie cutter task. Like the NIMS itself, anti-terrorism efforts must be very flexible, but the key is in preventing an event. As opposed to natural disasters, terror is a different animal. Hurricanes, earthquakes, and other natural disasters are going to come and go. Some are more predictable than others, and some come about with no warning. A hurricane does not look target people specifically to kill. It is chaotic, does damage, but the death toll is affected by random factors like storm surge, maximum sustained winds, etc. Effectiveness of local planning by authorities, prior to the event can also prevent loss of life. Terror has a mind behind it and is usually focused on killing or maiming victims for maximum media effect. Terror is by nature psychological and must be planned for accordingly. Hence the release of public information via PIO must be handled with caution as to not cause mass panic or tip off other terror cells as to what the authorities are doing, in cases where an attack is still actively taking place. There is a greater need for services like EMS, due to a potential for an increased body count/number of casualties. Triage for a mass casualty event would be must in most cases. Local authorities would have to be aware of certain terror tactics that involve an ambush scenario, where explosives or other destructive means are used to attack EMS personnel as they come on scene to triage and tend to the victims. This might require some additional planning on the part of the city/county fire department to assure that EMS does not walk into a situation where medical support would be injured/compromised. Emergency personnel must be trained to have an awareness to such threats. EMS always assess scene safety, as it is the first of 6 benchmarks that they are taught to apply when arriving on a scene. These ambush style attacks are generally concealed so a routine assessment of the scene will not typically reveal conventional warning signs. That is why it is imperative that we encourage this awareness as we navigate through this post 9/11 world that we live in. The attack in San Bernardino, that was carried out by two Muslims that also happened to be a married couple, involved an ambush style trap using IEDs placed in garbage cans and were set to go off when EMS arrived to help the victims. Luckily, none of them detonated, and they were found and disposed of by the bomb squad soon after. After developing an understanding of the nature of the threat and the ideological variations, there must be preparation at the state level. Our republican system of government recognizes state sovereignty, and state governments have a great deal of flexibility when it comes to governing themselves, as outlined in the 9th and 10th amendment. The federal government know that this is the case, and they know that it is impractical to try and use a standardized plan nationally and impose it on all 50 states. States should have that degree of anonymity, especially when it comes to prevention of large-scale attacks, even if they are a midwestern mostly rural state. Terrorists have shown us after 9/11 that they often focus on soft targets, and that large attacks like the one on the World Trade Center, are not always what they are looking for (Borgeson, 2018). Soft targets tend to have little or no security, and they have much more of a psychological effect on the average American. One might look at 9/11 and just decide that they are going to stay away from big cities. In their mind they are separating themselves from danger. But when an attack happens in a shopping mall, or a school, people start to get a feeling that they are not safe anywhere. This feeling of helplessness has a greater psychological effect on the masses. Getting into peoples’ heads is the top priority in the mind of a terrorist (Bjørgo, 2013). To understand the way that the sovereign states craft these plans, we’ll observe West Virginia (WV) and its Emergency Operations Plan. In this plan the Federal Bureau of Investigation (FBI), is referenced when looking to define the term terrorism. The FBI defines terrorism as, “the unlawful use of force or violence committed by a group or individual, against persons or property to intimidate or coerce a government, the civilian population, or any segment thereof, in furtherance of political or social objectives” (FBI definition of Terrorism, 2014). It also states that the threat of terrorism is increasing an that it can occur at the hands of domestic or foreign individuals or groups. West Virginia recognizes the National Terrorism Advisory System (NTAS) when it comes to communication with the public regarding potential terror threats. West Virginia’s Joint Operations Center (JOC), starts with the Command Group, that I made up of FBI, Department of Defense (DOD), Department of Health and Human Services (DHHS), DHS/FEMA, the Governor’s Homeland Security Advisor (HSA), and a few other state and local representatives. The Operations Group assess potential threats, and coinciding actions by local law enforcement. Operations is also responsible for breaking down and understanding the technical aspects of terrorists, including the materials, supplies, and weapons that they use. There Support Group provides assistance to the federal response in the JOC. The state of WV and all the localities that reside within, have the absolute authority to make decisions regarding prevention of terror events. This WV plan also includes a responsibility matrix for each of the state entities that take part in planning, prevention, and response. Emphasis must be placed on identifying terror threats before they can commit an act of terror. Response to an attack is completely different, because when you reach right of boom, you have a significant chaos factor, and you are limited in what you can do at that point. As sad as it is to say, response to a terror attack is cleaning up the bodies. Terrorists only must succeed one time, to give us another 9/11 style attack. Our intelligence community, federal, state, and local law enforcement, must be flawless 100 % of the time, to prevent them from doing that. Everyone has to be at the top of their game, and even the smallest mistake could be fatal. That is why planning for potential threats is so important. This distinction must be understood by all that are involved in the realm of both prevention and response. Recent headlines have domestic left-wing activist groups threatening violence is the current Supreme Court nominee is confirmed. The specific threat comes from Emily G as she calls for a “violent general strike” if Brett Kavanaugh is confirmed to the Supreme Court (Hoft, 2018). This is intimidation that is aimed at coercing government to act in a certain way or cease current action, and it is attempting to further a social objective. By definition this person and the group that she is representing, are threatening to commit an act of terrorism, per the FBI definition of the term, as referenced above because they are unhappy with the current political climate. This is the kind of rhetoric that local authorities need to be on top of. Federal resources cannot be used to discover everything about every group of radicals in the country. Local police departments and state law enforcement agencies have to make it their business, to stay on top of these things so that acts of violence can be prevented. Such intentions by radical anarchists to commit terrorist acts, should be taken very seriously. Those taking part in these acts should be handed charges that fall under terrorism that is federally enforced, rather than petty charges at the local level. Local authorities should cooperate 100% with federal authorities when there are requests for individuals to be in federal custody. Recent warnings from our Intelligence community, have referenced the danger that exists because of aerial drones that have become a common sight in 21st century America. More specifically, the threat here affects government structures in Washington DC, and other sensitive government targets. Also affected, are large public gatherings like sporting events that take place in large public venues. The concern is that a drone could be used to disperse chemical, or biological weapons over a large area with ease, and with the potential to affect many people at one time. Current law prohibits the forceful downing of a drone, even in extreme circumstances. This creates a problem when attempting to devise a method of prevention for this type of attack. However, I must imagine that if push came to shove, someone would down the drone that is going to cause mass injury and death and worry about legal implications later. You think it would be wise for lawmakers to fix this before it becomes an issue. It is obviously not beneficial to anyone if someone hesitates to act because in the back of their mind, they are worried about consequences of breaking the law. Preventing acts of terror through planning, requires an understanding of what you are dealing with, ideologically, psychologically and tactically. It is very difficult to defeat an ideology through overseas military action, or law enforcement here at home. The most effective way to combat ideological violence is to discredit the ideology that is fueling the action (Gorka,2016). This can be done through public education, in the form of facts. In this age of deceptive media, and institutional support of the deception, this can seem to be an impossible task. Terrorism should not be confused with criminality, and there should not be an attempt to try terrorists in a criminal court, nor should common criminals be tried as enemy combatants via a military tribunal. The line here is a fine one, but it has to be straight forward and non-ambiguous. 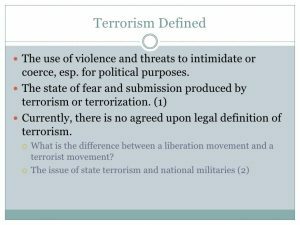 In summary, we recognize the need for an understanding of terrorist ideology, and the fact that this ideology can vary based on the individual or groups’ motivation, world view, and desired end or ultimate goal. Operational planning for potential terrorist attacks, must take these things into account in order to devise an effective method of prevention. There must also be distinct contrast between terrorism and general criminality, and the two shall not be used interchangeably in regard to our legal system. States and localities should be able to act with anonymity, so that they can make decisions on how to best serve the various demographics that make up their overall population and to keep with the spirit of federalism. To conclude, states and local communities have to have the flexibility to take care of the people that they are responsible for. No on knows the population of an area, city, or state, better that the government that is closest to the people of that community. Flexibility and adaptability are key in keeping the people safe. Bjørgo, T. (2013). Strategies for preventing terrorism. New York: Palgrave Macmillan. Borgeson, K. (2018). Terrorism in America. Routledge. Gorka, S. (2016). Defeating Jihad. Washington, D.C.: Regnery Publishing, A Division of Salem Media Group.